« Lost In Myth: “Whatever Happened, Happened”—Figuring Out Your Destiny From “Lost” and Life. Lost In Myth: Is Dead Really Dead? When we had last left Lost, Richard Alpert was carrying a dying young Ben into the temple in hopes of bringing him back to the land of the living—assuming that’s where they even are. The scene seemed very familiar to me and I was racking my brain to remember why. An Egyptian-looking guy who may be a god (the never-aging Richard Alpert’s initials are RA which just so happens to be the name of the Egyptian sun god) was carrying a young boy into a temple to meet with a god of the afterworld. I knew I’d seen it somewhere before. Then, it hit me. It was just like a scene out of The Ten Commandments! 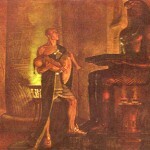 After the tenth plague, Rameses (a king who is worshipped as a god) carries the limp body of his son to a temple and places him on the altar of the falcon-headed Sokar—the Egyptian god of death. Unlike Ben, the boy is not resuscitated. 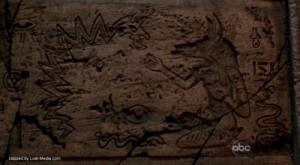 Perhaps Rameses would’ve been better off using the jackal-headed god of the afterlife Anubis (seen kneeling in the hieroglyphics before the smoke monster in “Dead Is Dead.”) What’s particularly serendipitous about this scene comparison is that The Ten Commandments is about the exodus of Jews from Egypt that is commemorated on Passover, on which “Dead Is Dead” aired during the first night of. “Dead Is Dead” continues the story of young Ben, revealing that he has been brought back to life—reborn, just as Locke has been. Even more serendipitously, this theme fits in perfectly with another event that occurred the same day “Dead Is Dead” aired—a rare, astronomical and important spiritual event. As many Lost fans may recall, “Tabla Rasa” is the title of the first season episode where we learn that Kate was a fugitive but had been given a clean slate on the island. In “Dead Is Dead” it is Ben who is pardoned by the smoke monster and allowed to start again, this time to follow the orders of Locke. Just as on Lost, there are no accidents—everything happens for a reason. This once-in-28-years phenomenon along with the freedom themes of Passover and even the resurrection theme of Easter all coinciding with this episode’s similar themes are the universe’s way of letting us know that the seemingly magical rules on Lost island also apply in our world. And this brings me back to what those rules are telling us. There were actually dozens of interesting parallels in “Dead Is Dead.” One was Ben not killing Penny because he didn’t want to leave her son motherless just as he’d been. This reminded me of Sawyer not scamming a family who had a son because he didn’t want to be like the monster that had ruined his own family. Just as Luke realized as he looked down at his own robotic hand after chopping off Vader’s, we are sometimes tempted to become the thing we hate most. But I’m not going to focus on this theme, or the parallels of Widmore as Satan being cast off the island for his sins, or the conclusions to be drawn from Alex growing ever-so-much hotter in the afterworld. Instead, because of the title of this episode, I’d rather focus on when dead really is dead. Dead certainly isn’t dead for Locke, who is the same as he’s always been, according to his own assertion to Sun. Death also was not to be the fate of young Ben who was saved due to the island’s mysterious powers. He was also not killed by the smoke monster, which decided to give him another chance to make things right. His dead daughter Alex told him so. Alex probably is dead, but allowed to appear thanks to the smoke monster. This may also be the case for Christian Shephard who was referenced but not seen in the episode, but is known to be wondering around despite having died. So what exactly is going on here? So is dead really dead then? According to Lost (and movies like Final Destination), only if it’s your time to die. If you still have unfinished business to do, you’ll live. This perspective of life pretty much takes us out of the equation when it comes to matters of life and death. It’s actually pretty comforting to believe in it. When someone we love dies, it’s hard not to wonder, “what if.” What if he hadn’t taken that flight, or eaten that food that got him sick, or what if we’d caught her disease earlier? Sometimes we feel responsible. According this viewpoint though, the end result is out of our hands. There is simply nothing that we could do. Even if we had prevented one source of death, another would simply come up in its place. Just as people have proxies, perhaps life situations have proxies too. On the other hand, perhaps you know someone who’s had several close calls or even near-death experiences. Maybe you can remember some time from your own life when you thought you were a goner for sure—that logically, you absolutely should’ve died or been very severely hurt. You can think that you were just lucky, or, look at it from a different perspective—the perspective of the universe. Like the island for Desmond, the universe isn’t done with you yet. It just may be that you have a very important role to play in the movie of your life, and there are many characters that are depending on you to complete it. Or, put another way, you are an invaluable gear in the universal clock, and without you, the whole mechanism comes to a screeching halt. The point is, you weren’t just lucky, you are needed, and you have work to do. Use the clues that Lost teaches us to look for, and begin to piece them together to find your true calling. What is it that you are meant to do? How do you fit into the universal scheme of things? Figure it out and achieve it and the person who needs you to succeed will be able to do what they are meant to do. This in turn will enable someone else to do their job and others to do theirs and so on. This is why one person can be so important. The fate of the entire world just might rest on your very capable shoulders. Good luck, we’re all counting on you.